It’s been a busy few weeks for Frankie and LuLu Cavanagh. Their debut book, A Canine’s Guide to the Good Life is now available on Amazon and their press tour has begun. First stop: An interview with HumorOutcasts.com. Frankie gives LuLu some pointers on answering press questions. HO: How did you come up with the idea of the book? LuLu: Mom told us to outline our ideas first and she would help us put them into sentences. HO: How did you get so many dogs to be a part of the book? Frankie: I am trying to get along but I’m not comfortable in a crowd, but I am still a very good girl. LuLu: Yea, whatever. But they liked the idea of being in the book so they sent in pictures. 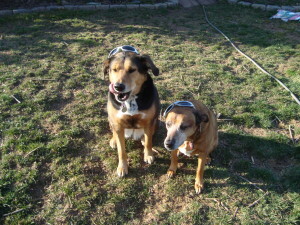 Then, our Mom asked some friends from all over the country and some place called England if their dogs might be interested too, and they all agreed. HO: Why is this book important? 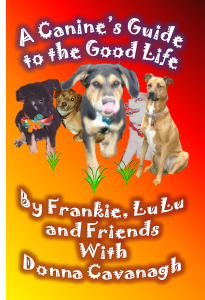 Frankie: I think it is different because it is a short and easy-to-read guidebook which gives practical tips on how to have a good home written from the perspective of the dog. LuLu: Usually, books talk about the human experience, but we wanted to share our own thoughts about the “real dog” experience. Frankie: And our view provides insight on what it’s like to be underneath all this fur. LuLu: Provides insight? Where did you learn that term? Were you watching Dr. Phil again? HO: Do you think this book will reach a good audience? Frankie: Who doesn’t love a dog? Frankie: That doesn’t mean they don’t like dogs. LuLu: Shut up about food! That’s why you are 85 pounds! Frankie: You shut up…I’m not the one who is the treat whore in this house! Frankie: Wanna take it out to the yard? LuLu: Mom, Frankie is picking on me! HO: Okay, let’s move on. Any promotional events planned for your first book? Frankie: I am sort of a reclusive author — like Salman Rushdie. Not that there is a bounty on my head — I don’t think anyway. I have my license and all my shots, so I am legal, but I just like to be with my mom and dad and our human sister C.C. when she is home. LuLu: I could go on the road. I’m cute, and I like to mingle. Mom says if I turn into a party chick though, the tour ends immediately. She doesn’t want to be known as another LiLo’s Mother (that is Lindsay Lohan for those pooches who don’t get to tune into E! during the day) or in my case, LuLu’s mother, and we are not allowed to sign on to a reality series either. So, she is really limiting our options. HO: What’s next for you two authors? Frankie: We would like to do a You Tube video for the book. We are in talks now (with our Dad to see if he has time to shoot it). We would also like to do a guidebook about other animals as well. We have talked to a few farm and family pet friends and they are up for it, so we shall see. LuLu: Truthfully, I need a vacation after this book release. It’s been a grueling process, and I am emotionally spent. Frankie: From what? You didn’t even do the typing. You are such Diva. 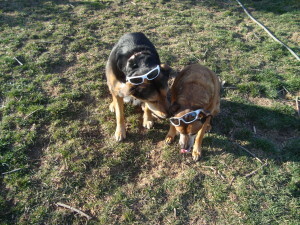 LuLu: Have you seen my Prada sunglasses? I misplaced them. *****A portion of all royalties for this book will go to PA SPCA and pet charities! Tell Corporal, she is hired!!! Thanks Laurie, and they picked them out themselves. They don’t want to be recognized all the time. Well, Theresa, you never know where these two will wind up! Thanks Mario. I hope Gregory love it! I look forward to reading this Don Don’s. I can almost see the cartoon! Thank you Bill! And not one Bon Jovi mention in the book. Frankie and LuLu respect you too much for that. Love to see the press that Frankie & Lulu are getting. Well deserved. Do they have a literary agent? If so, might they put in a good word for me? Sounds like a fun read. Did you include any of Lulu and Frankie’s Christmas carols? No, because it is a legitimate guidebook on how to have a good life and they had to include so many friends and it’s color which means our printing costs were astronomical, and so we chose to highlight other pooches more than them. Who knows what is down the road for them though! Looks like you had fun with this one Donna. Good luck with it. The SPCA is a worthy beneficiary for its success. Thanks Larry! The girls and myself are excited!